When a box is this small (maybe 5”x5”), you know you won’t have much set-up to worry about. The one wrinkle could be a complicated rulebook; Friday’s is delightfully thin and straight-forward. I was starting my first game within 20 minutes of opening the box. That game took around 45 minutes, and while I won, that was only because I was badly mangling a few rules. Call it a casualty of not having someone around to bounce thoughts off of. Repeat plays have fallen between 15 minutes (usually swift loses) and 45 minutes (against more difficult Pirates). Once playing under the correct rules (starting game 2), the losses piled up. As far as I can tell, “mastering” Friday means getting to a point where you can win 1 in 3 games. I’m really not there yet. I can’t imagine this game taking longer than 10 minutes to teach, as it’s easy to learn from the rulebook… but I have never taught another person a solitaire game, as that would defeat the purpose of getting them to play games with me. I guess I could describe myself… but I’ll save you that act of hubris. This is such a neat little story. It’s a re-working of Robinson Crusoe told from the point of view of “Friday”, a prisoner on the island Crusoe finds himself shipwrecked on. The game removes the heavier themes of the novel (religion, cannibalism, etc.) and re-writes Crusoe as a bumbling idiot who must be taught the survival skills necessary to escape the island. Enter the player, assuming the role of “Friday”. There is nothing objectionable here, and I would relish the chance to teach this to my child if and when Robinson Crusoe becomes part of his school curriculum. There are plenty of large-in-scope cooperative card-based games that can be played solitaire, and Friday really doesn’t stack up well against them. This is just 72 cards… they don’t change, and eventually you know everything the game has to offer. However, there are a few smaller-scope solitaire card games that look more interesting to me than Friday as well – Onirim and Urbion. I have tried neither, but the theme they share appeals to me now that I’ve worn Friday out. This game hit my table during every spare moment of down-time I could find for the first month that I owned it… but it hasn’t been played since. It grabs you immediately and burns out just as quickly. If you tend to obsess over games like I do – where a new game becomes all you think about for weeks on end, and you capitalize on every chance to play it again – you are going to be done with this one pretty quickly. On the other hand, if you’re more patient and only pull Friday out weekly, you could get some mileage out of it. But one way or another, this was always going to become the least re-playable game I own. I love board games, more and more I try to arrange board gaming with my friends and colleagues each and every weekend or sometimes weekdays and when it comes together it is always a great time with friends, games and maybe something good to drink. But sometimes it is not that easy to get together four or more people to have some great gaming done, sometimes it’s just a regular Wednesday and it’s eight o clock, but I still find myself wanting to play some board games, now what? Enter the genre of solo board games, a place often associated with either heavy war games or boring solitaire card games, but what about the board games that you usually like to play? Are there any games out there that take between 30 to 60 minutes to play and offer strategic and fun decisions to achieve some goal or beat some challenge? A euro game for one if you like. I found such a game and it is called Friday by Friedman Friese. The game puts you in the role of Friday living on a quiet island, until Robinson shows up and disturbs the peace. You’r task is to help Robinson leave the island and to do this he must defeat a myriad of challenges and finally face off with two pirate ships before he can leave. This is done trough a deck building mechanism that is the core of the game. You start off with a Robinson fighting deck that contains many terrible cards and a few barely ok ones. You draw challenges from a challenge deck and draw cards from you’r terrible fighting deck to try to beat the challenge. If you beat the challenge you add the challenge card to you’r deck, it has two orientations where one is a fighting card and the other a challenge, if you loose the challenge card goes back to the challenge discard pile. But loosing the challenge still requires you to meet the challenge number, but instead you pay life points to meet it, for these spent life points you may discard fighting cards from you’r deck permanently. This mechanism of paying life to loose bad cards from you’r deck is the key to the whole game as you must rid you’r terrible deck of bad fighting cards, but also you can’t spend to many life points. The game captures what I love the most about board games, the decisions. You must pick one of two drawn challenges, you must choose to stop or continue drawing free cards, you must decide how to use card abilities, how to spend life points. All these decisions you make during the game makes it feel very much your fault if Robinson dies and your achievement if he defeats the pirates and leaves. The choices are also what makes the game fun and challenging. I have played Friday seven times now and the game was fun and challenging each time, I have won two times and lost the rest. The game has four difficulty levels so the next step for me is to increase the difficulty and still beat the game and also hopefully get a good score. The game box is very small so it’s perfect to take on trips, tough it requires some space to play so probably not a car or plane game, but I did manage to play one round on a train when I got a table all to myself. If you are looking for a great solo adventure that plays in 30 to 40 minutes and gives a fun and rewarding challenge then look no further then Friday. Friday is a super-portable uniquely solo-only card game with deck building mechanics. It describes the titular character’s efforts to teach Robinson Crusoe the necessary skills to get off the deserted island. Quick, tactical and challenging, it offers a good way to pass 20 minutes, but offers limited replayability. You take the role of the local helping the shipwrecked Crusoe. Apparently you don’t like having him around and the best way to get rid of him is to help him get back home. In order to do that Robinson will have to learn how to shake off his weaknesses and effects of aging and to become smart, determined and brave. With the help of items he scavenges he will be able to overcome pirates (who in a surprise twist are the main obstacle to getting out) and return home. The game features deckbuilding prominently – you start with a fairly weak deck representing the freshly shipwrecked Crusoe – weak, hungry and distraught, though with some focus and smarts with him. You go through a series of encounters that allow you to use your existing cards to face the hazards of the island – wild beasts, cannibals, expeditions to the ship wreck. Each encounter allows you to either gain a new card for your deck or to get rid of unwanted cards by losing life. Life is represented by chunky wooden tokens and is a limited resource. The goal is to improve your deck by adding strong cards to it and getting rid of your weaknesses. Time is against you though as every so often Crusoe will get older, adding penalty Aging cards to your pool. Once you go through the encounters on the island three times in phases of increasing difficulty, you fight the final bosses of the game – two pirate ships – it is an ultimate test for how well your deck is constructed. If you survive both battles you are victorious. The tactical decisions in Friday are meaningful and are mostly about how risky do you want to get with your life supply. Riskier plays will see you sacrifice it early to get a strong deck sooner while more cautious players might prefer keeping Robinson safer, if weaker.Luck of the draw plays a small role in the game so fans of planning will be pleased. Selecting which hazards to face is another interesting choice and is based on what you know about your deck’s current state. Many cards have additional special effects that run the gamut from being very clear to somewhat confusing and these will have you checking the rulebook (of medium helpfulness) frequently. While there is some theme to be found (e.g. searching a shipwreck gives you “Equipment” card that allows you to bring more cards into play for free) – it quickly gets lost in the brisk pace of the game. The theme does not feel pasted on but never emerges as a significant contributor to the enjoyment. The game can get a lot like a card solitaire in that often there is a clear best thing to do and you are just going through the motions. Once you know what the deck can offer it is not particularly difficult to plan accordingly. Bad luck or aging cards can still sink you but at that point it’s out of your control. Because of this obviousness, Friday will become trivial quickly if you play it a lot. It should be mentioned that the art of the game is rudimentary at best – if production values play a big role – this will detract from your experience as artwork is decidedly basic. While not without its’ flaws, Friday is an attractive package – it’s quick, easy to pick up, proud of it solitaire status and offers some tactics, fast pace and a reasonable challenge. If the basic art doesn’t bother you and you don’t play too much of it too soon it can become a solid minor addiction to your collection and a trusty travel companion. Which would be only fitting, given the name. SHIPWRECKED! Stuck on an island with only his trusty man-servant Friday, and and a lot of hazards, Robinson Crusoe must survive the island and develop into a skilled pirate-fighting machine! I’ve never really played a fast, solo card game outside of Solitaire so I don’t have much basis for comparison. I would play a fast solo game when I’m waiting, when I’m traveling, or just to kill some time. With these situations in mind, there are certain things that I look for. 1.Easy and fast to play. 2.Some type of strategy, even if light. 3.Ways to change playing experience. 4.Not a lot of space required, and portable. So, what’s the gameplay like? I’m not going to go into the game play too much. That’s what the rulebook is for! The goal of the game is to survive the different stages, and defeat the pirates. You do this by building the best deck you can for Robinson Crusoe. You set up the hazard cards (two sided cards, you defeat the hazard at the top and you gain a skill on the bottom of the card and add to your deck), RC’s deck, the aging cards, the life tokens, and the 2 pirate ships, randomly drawn. Essentially you are trying to defeat, or intentionally lose to the hazards in order to gain useful skills and get rid of some of your bad habits. This dynamic stumped me at first, but it makes sense. If you are distracted and get attacked by a wild animal, it’s less likely you will be distracted next time (if you survive…) because of that bad experience. So you learn from mistakes. Over time you age and add an aging card to your deck which makes you weaker. The hazards get harder, until you are paired up against 2 pirates and must defeat them in order to win. 1.Quick to setup and easy to play. 3.varying difficulty levels changes gaming experience. Also, able to tweak certain rules to change game experience. My only gripe is that for a fast solo game, it’s a little bigger than I’d prefer and the box isn’t pocket sized. I feel like for most of the situations I play it in, if it was just a little smaller it’d be great. You could play this without the boards, and use paper pencil instead of the tokens, but it’s slightly bigger than I’d like. If this was a “fit in your pocket” game I’d rank it MUCH higher. I think portability is key for fast solo games. For people who like to really focus on strategy, or want an in-depth experience, this isn’t it. It will be interesting at first, but then fade fast. So overall, for a quick, fun solo game to kill time while waiting, it’s pretty good. It’s not a game you get super excited for, but it’s fun, and there for you when you need it. There’s a lot going for this little game. It’s simple enough to get your head around the basic concept but at the same time you really find yourself poring over some of the decisions that come up in the game. Many of the cards have special abilities when used as fighting cards giving another layer to think about. Combine that with the number of cards in the deck and you have a game that has a good amount of replayability. Repeated plays do feel different. In one game you might find yourself spending a lot of life rapidly to thin out your deck because the first Hazards are simply too difficult. The following game might feel easier because that hasn’t happened but then a tricky hazard crops up later and spoils your plans. Play can be very tense. You start off feeling confident with lots of life but you soon find yourself with only a couple of Life tokens left begging that the top Fighting card will be enough to defeat the Hazard! This gives the feeling that the game is a real challenge. When you do win against the game then you truly feel like you achieved something! The length of play is good, too. It takes about 20 minutes to play a game so fits nicely into a lunchbreak if you’ve found yourself on your tod (as I have a few times 🙂 ). And if you think it’s all getting a bit too easy, there is a scoring mechanism of adding up good cards and taking off bad cards. This means a player can see if they are improving or not over time. If the game is still too easy then there are four levels to play at, making the game gradually more and more difficult. There’s not many cons, to be honest. One might be the artwork; as I mentioned above I did walk past this game the first time I saw it. The art gave me no idea of how deep the game is. But once you’ve got playing the artwork is soon ok.
Secondly, there might be a slight issue with some translations. The rulebook is nicely laid out and gives plenty of examples but there were still a couple of rules that confused me the first time I played it. A couple of terms were used with slightly different meanings in the rules leading to some misunderstanding. I did have to check the rule about paying life when being defeated by a Hazard as I thought I still got to keep the Hazard afterwards! This is quite fundamental! But those are small cons compared to the pros. This game is very good and I have already clocked up many games of it since acquiring it this year. I suspect there are many more games of Friday to be had by me. The only thing is: can you bring yourself to game solo? This almost feels like crossing a certain line of geekiness. That said, there are times that you just want to game and there’s nobody around! I would highly recommend this to anyone who enjoys board games in general, particular if they sometimes have problem getting enough people together to scratch that board game itch! Go on – give Crusoe a hand, you’ll feel a real sense of victory when he escapes from the island! I bought Friday initially for inspiration. I was trying to design a cooperative game and Friday provides push back and goals that a player must overcome, so I thought it would make good inspiration. I didn’t expect to like it, let alone love it, but here we are! Now, Friday is always in my backpack. Friday is a beautifully smooth, elegant experience. You draw 2 challenges and pick one. The other is placed in a discard. Depending on the phase (there are 3, green/yellow/red) you must equal or exceed a difficulty number. You get a set number (based on the challenge) of free cards. If your cards equal or exceed the number, you win and you add the challenge card to your deck. If you fail, you lose health, but you can also trash (i.e. permanently remove from game) bad cards from your deck. This is the fundamental strategy: do you work and sacrifice to win the challenge? Or do you lose, at the expense of life, to get rid of bad cards? After three runs through the challenge deck (i.e. 3 phases), you must fight the pirates. At this point, your deck better be good enough or the pirates will defeat you! The challenge cards not only give you better numbers with which to defeat challenges, but they give you simple abilities to mitigate bad things, move through your deck, and more. Friday is a very difficult game, but your choices matter far more than luck and randomness. This is such a tight, smooth game that you’ll spend very little time counting and tallying numbers, which is something other solo games tend to have. The game travels well, has great components, plays quickly, and again, is so smooth and elegant. This game is about $20 in your FLGS and $15 on Amazon. If you have any interest in a game solo, get this one. It’s great. A solo card game where you are the smart and lonely Friday and you must teach the dumb newcomer Robinson Crusoe to survive the hazards of wild life. If you are successful he will go away and leave you alone and happy in your heavenly island. Basically you draw cards (from two different decks, hazard and fighting) and use its special abilities to get good fighting cards while trying to eliminate the bad ones. Each time the fighting deck is depleted you reshuffle it with one extra nasty card, representing the fact that Robinson is aging. After the hazard deck is emptied three times, you must defeat two pirate cards to win the game. – Which hazard card you will fight. – if you want to continue drawing free fighting cards. – In case of defeat to the hazard card, which fighting card you want to destroy. – if you will lose health to draw one more fighting card. – if you activate the cards’ special abilities and in what order they will be activated. It is simple, quick and fun. It has a good number of meaningful decisions, both tactical and strategic. Sometimes an immediate win over a hazard card is not the right decision, you may want to lose the fight to get rid of a nasty fighting card. A lot of people will not like it simply because it is a solo game. If you don’t mind that, the game may not be as replayable as it seems. Perhaps, after a certain number os plays you will know the best strategy and then the game will lose its appeal. The theme is not necessary to enjoy the game, after a few plays you will probably ignore it. At first you will feel like a teacher trying to teach a difficult topic to a student that is not yet prepared to learn it. You will have to be patient and smart. With the passing of time you will feel satisfied seeing how good Robinson (the fighting deck) has became. Hi everybody from Barcelona (Catalonia, Europe) ! Friday is an easy game. Learning the rules won’t take you more than 5 minutes. The objective is to teach Robinson how to survive in his new habitat. You are Crusoe’s Friday, and your mission is making Robinson strong enough to face the fiercest pirate’s attack that occurs at the end. We could say the game has two parts. The first one, where you try to build your best set of cards (it’s a deck building game), where you try to gain habilities (cards), that bring you more power to gain more habilities, as well as try to discard your worst cards. And the second one in which, with the deck that you build in the first part, you have to fight the pirates. The second thought is that this game doesn’t involve strategy, way less than King of Tokyo to mention a mainly luck based game. It’s a strongly luck based game which I don’t find good or bad, but it’s important to be said. The third one is the fact that you spend more time shuffling your cards than really playing. That is a fact. Having played Friday around 30 times, i’m glad i gained shuffling habilities, but i didn’t enjoy playing this game as much as I expected. This is a fun little solo only game. It was the first one I played in the solo only genre. Having said that, I now have several games that support solo play and a few more solo only games (thanks Z Man Games, and Victory Point Games. The game components are good quality. I like that there are wooden leaf counters for Robinson Crusoes life total. The cards are sturdy enough, but nothing to write home about. The artwork on the cards is a bit cartoonish, but icons are clearly marked and color coding is good. Gameplay is fun and has some choices to make when playing against the deck. With each challenge you face, you can decide at any point to fail it, and with the learning system for your character, failing a challenge is sometimes more beneficial than completing it. The mechanics are simple, but well woven into the theme of helping poor old Robinson to survive on this difficult island. The appearance of Pirates at the end of the game is where the challenge really comes in. It is important to remember while playing that you are preparing for a “boss fight”, not simply surviving. That lends more thinking and weight to early game decisions in my opinion. The downside to a simple game is that there will be limited replay. This is not a long term limitation in my view, but simply means that I play this game once or twice a month instead of every day. Friday is like a college roommate visiting. Fun to visit, glad I’m not living together anymore. The mechanics are solid, so the game is engaging; it just doesn’t have the complexity to survive 100 run through’s in a week. Overall, this is a great way to break into solo gaming if that is something you are interested in. It also makes a great filler if someone gets kicked out of a longer game and needs to do something until the next game. It will definitely stay in my collection and make appearances on my desk and gaming table. 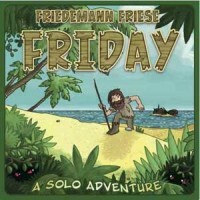 I am not a huge deckbuilder fan, maybe its all the shuffling that goes on… However I have wanted to get Friday ever since I read about it, mainly because I am primarily a solitare gamer and have always wanted to try a Friedemann Friese game. Heard all about him but don’t really have a group that is really into Euros to justify buying any of his other games. When I first got the game it took me some time to understand some of the rules but once I got into it, I was impressed by how he was able to bring in some interesting mechanics to what is to me a tired mechanism by now. The choices the player have to make is meaning every round and unlike a lot co-op/solo games I play, randomness is not overwhelming. I highly recommend this game to anyone who likes solo games that engage them on a cognitive level i.e. puzzly games EVEN if they don’t like deck-building as a mechanic. I originally rated this game as a 6. That was before I traded it away. I bought Friday confident both in all of the good reviews I had read (here and elsewhere) and in the designer’s excellent reputation. I was severely disappointed by this game. I am but a casual gamer, and perhaps that is why this game left me cold, as avid gamers above all seem to agree this is excellent. Don’t get me wrong, the mechanics are very good, even I can tell. The game is a clever one, but it wasn’t, for me, a fun one. The art left me very unaffected and the gameplay just felt like work. I did not feel interested in Robinsoe’s victory, I did not wish to associate with him. I felt it was repetitive, even after only a few (10) plays. I personally think that in order for a solo game to work, it has to draw the player in and this one just didn’t do it for me. For “pure” solo games, I’d recommend Onirim or Equilibrion over Friday any day. Disclaimer: I played 3 times and lost every time. Game is hard to win, but very addictive: once you “get it”, there is that One More Play feeling. There are enough choices at each turn, theme feels good. At first it may seem there is not much variation in the cards but there is plenty in the combination of the cards. Manual: the manual does not take you by the hand. It consists of two leaflets. One shows the setup, the other describes the game round. It is important to sort the cards on the amount of green “hearts” in the corner first, and keep the special -3 very stupid out. The manual does not mention that. I had to re-read the manuals several times, and after watching some yt reviews I finally got it right. A minus point for the bad manual and the fact that even on easy the game will be too hard for the majority of gamers (let alone the human population). The game has 22 wooden chits that don’t even resemble hearts, but the 2 are never used so what’s the use? I can’t see how anyone can say this game is repetitive – the pirate ships are very different each time and sensational. I bought the dutch version for 10 euro from summoner, sealed and new and all. Highly recommend! EDIT: the manual is terrible. When you lose a conflict you can pay by discarding cards. If you come up short, AFTER paying with cards, you lose life. If your cards overpay the difference (e.g. a stop card displaying 2 life, vs. a green challenge that requires 1), you may not use the card if it overpays. The manual didn’t explain this, and I (as well as many others) misunderstood and thought we always had to pay the full difference with life, and had the option to discard cards. Now that I play with the new rule, actually ‘building for pirates’ makes more sense, and also it is possible to have more life than the 20 you started with so that also makes more sense. The game shines brightly in the combo’s that you will be able to make in the middle game. Question: how can I rate games on this site? I’m a solo gamer at heart and its annoying there aren’t more games like Friday. A purely solitaire deck building game that tasks you with guiding Robinson Crusoe from hapless castaway to experienced explorer/fighter/hunter. The ultimate goal for Friday is to get Crusoe off the island. Easy to learn, quick to set up and tear down, playable within 20 mins. The biggest selling point for me was the scoring system. Whether you succeed in Friday or not, you still get to tally a score of victory points that gives impetus for further (often immediate) plays. Let me start by saying you can only play friday by your self, however dont let that scare you off it is an awesome game! Its actually one of my favorite games due to the reason you can just play it by yourself while your sitting around. Ive probaly played close to 30 or 40 games and I LOVE THIS GAME! IN friday your playing as a guy trying to help Robinson Crusoe not get killed by pirates, you have to build a better deck in order to do that and try not to lose your health points. Every game is a little bit different and the game is a blast! For those who like to play with themselves some time this is a must own! Add a Review for "Friday"